The NovaScope 6000 has been developed for the most demanding of thickness gauging tasks such as the wall thickness of turbine blades or on line wall thickness measurement of tubes at high speed. It has outstanding performance and high accuracy. The NovaScope 6000 - Precision Ultrasonic Thickness Gauge. For More than 40 years, the NovaScope series of instruments have been the first choice for high precision ultrasonic thickness measurements. Introduced to the market in 2015, the latest iteration designated NovaScope 6000 incorporates the proven, traditional features which customers came to appreciate and rely on throughout the instrument’s generations. In addition, new capabilities have been designed which offer advanced possibilities to fine-tune and customize measurement setups. The instrument is loaded with a series of parameters and adjustment options to make literally any conventional UT probe from any manufacturer work at its best. From a handling perspective, it also became battery-operated as well as lighter than ever before. The NovaScope continues to incorporate a full colour touch screen display featuring virtual front panel controls that mimic the same layout as it’s predecessors. 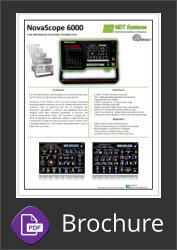 Users already familiar with the set-up and operation of previous NovaScope models will feel right at home. 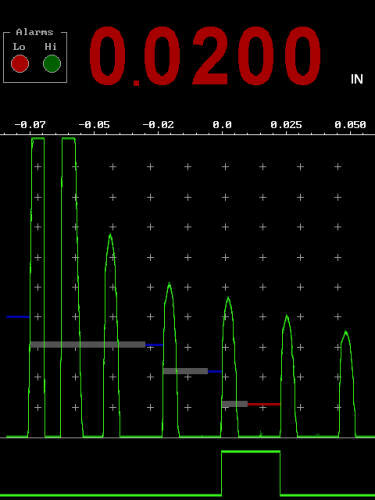 Previous calibration procedures continue to directly apply to the NovaScope. • Class leading ultra thin spatial resolution • High-Resolution (0.0001in, 0.0025mm) • Touch-screen controls • Familiar menu layout, screens and setups. A New Bright, High Speed, High Contrast TFT display offering almost a digital phosphor look, closely emulating the favourite CRT that has been offered on all NovaScopes previously.. (by popular demand). This new fluid like display is sure to satisfy the most discriminating users... old & new. All this AND, STILL the finest thickness measuring instrument available! 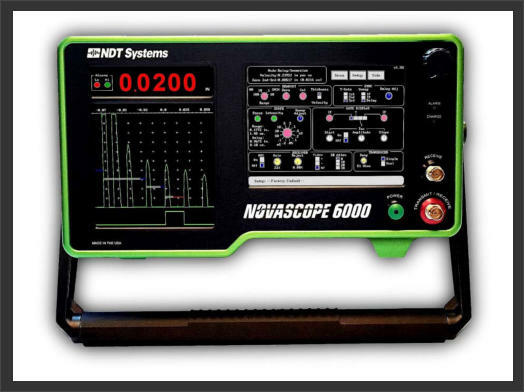 NovaScope 6000 Thickness Testing Applications Include: • Turbine Blades • Tubing • Pipe • Sheet • Plate • Extrusions • Billets • Liners & Casings • Chemical milling • Castings • Stampings • Graphite Composites • Carbon-Carbon Comp • Kevlar Composites • Fibreglass Composites • Blow Mouldings • Wax Castings • Valves • Forgings • Tyres • Cladding • Heat Exchangers • Machined Parts • Bars • Shrouds • Lenses • Tanks / Drums • Pressure Vessels • Corrosion / Erosion • Discs • Drawn / Spun Parts • Bottles Features & Specifications Features: • 0.0001” (0.0025mm) digital resolution; as low as 0.010” (0.254mm) thickness resolution • Compatible with contact, delay line or immersion transducers. 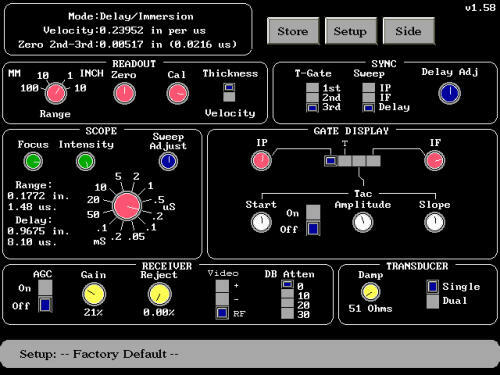 • Dual-Trace display; A-Trace and gates•Displays English or Metric Units • Velocity Display (quartz stabilized, digital) • Full RF or rectified RF display • Selectable multiple echo interval • Receiver attenuation control plus manual gain and Gated Automatic Gain Control • TAC (Thickness Amplitude Compensation) for noise suppression • Outputs: Alarms, Analogue thickness, USB, Serial RS232C Dimensional Readout: English & Metric • Gauging Range (depending on material) o English: 0.005-10 inches o Metric: 0.13-100mm Digital Resolution: English Units • +/- 0.0001” on 1” range • +/- 0.001” on 10” range Metric Units • +/-0.001mm on 10mm range • +/-0.01mm on 100mm range Measuring Mode • Sets mode for contact, delay line or immersion transducers Readout Mode • Selects digital display for thickness or velocity Pulser Risetime • 5 ns Amplitude • 150, 250, 400 volts • Peak into 50 Ohms Repetition Rate Selectable for 625, 1250, 2500 or 5000 Hz Variable 50-5000 Damping • 15 to 520 Ohms - 1 Ohm increments Receiver Adjustable Gain • 100 dB Automatic gain control • 100dB dynamic range Reject • Variable threshold to full scale Bandwidth • 30MHz (3 dB down) Attenuator • 0, 10 and 20 dB selectable A-Trace Display Sweep Width • Switchable down to 50 ns/Div • Continuously adjustable Sweep delay • 1 ms to 80 ms Display • Dual Trace; A-Trace plus selectable • Gate Traces (IP, IF, T or TAC) Display modes • Full wave RF, positive or negative • Rectified T-Gate • Thickness gate with adjustable sync T-Gate Start/Stop • Selectable on positive or negative half cycles IP-Gate • 0.25 to 20 ms (contact), 1.0 to 0 ms (continued) (delay or immersion) IF-Gate • 0.1 to 8.0 ms TAC-Gate • Adjustable thickness amplitude • Compensation of gain • Start control: 0.02 to 6ms • Amplitude control: 0 to 100 dB • Slope control: 0.1 to 50 ms Alarms • Three functions: LO, HI, LO/HI Outputs • Alarms, Analogue thickness Serial RS232C, IP Sync and USB Inputs • External Sync Power Source • Battery & AC Power Consumption • 50 Watts Warranty • One Year (Return to Base) The Specifications in this document are preliminary and subject to change without notice.